Days after a group of Montreal students took home one of the world's premier awards for social innovation -- from the hands of former U.S. president Bill Clinton, no less -- Jakub Dzamba hears nothing but crickets. The 31-year-old engineering student is surrounded by the chirping critters. It's a labour of love for Dzamba, who has won academic acclaim for his 'cricket reactors' -- essentially breeding the insects in micro-farms, and ultimately grinding them up into flour to feed people. But when crickets stole the show at this year's Hult Prize, Dzamba was left with a decidedly bad taste in his mouth. "It was frustrating to see the way it happened," Dzamba told the Huffington Post. He feels his fellow students at McGill University stole his million-dollar baby -- a charge they vehemently deny. "McGill University, which values academic integrity and owns the patent, states unequivocally that our business has zero to do with Jakub," team member Jesse Pearlstein fired back. Considered the world's largest student competition to solve social challenges, the Hult Prize involves some 10,000 students from more than 150 countries. And it comes with a $1-million bounty for students to use as seed capital. "The mandate of the competition," Dzamba notes, "is to instill business ethics among college and university students in the wake of the 2008 financial crisis." This year, a five-member team from McGill was handed the award in New York City by the 42nd president of the United States. "No one would believe we gave an international award [to a team] who told us to eat more crickets," Clinton noted. "But the truth is they are a ready source of protein ... You're laughing, but this is going to be an amazing thing." No one has to tell Jakub Dzamba that. He's been chirping about the power of crickets since his first year in the University of Toronto's architecture program. It was 2009 and the class assignment was to come up with a model for growing a lot of food in a very small space. "No one could really figure it out. Some people did a vineyard and a chicken farm and stuff like that," he recalled. "But none of them could grow very much food." 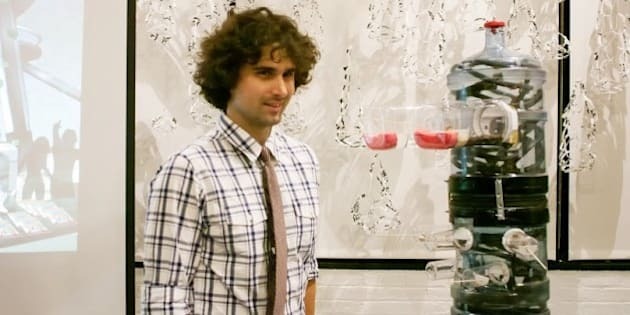 "I came up with the wacky idea of using city waste water to farm algae and feeding that algae to insects and grinding insects up into flour and feeding that to people. We did some calculations and it turns out you can feed many, many times more people with that farming method than you could farming any other type of mammal or livestock." In class, Dzamba's idea went down like a lead balloon. "I think I got the worst grade possible." But a year later, he was presenting his cricket farming ideas at a conference in Bangladesh. And by 2012, his idea had earned third prize in McGill's University's Dobson Cup. It was at McGill, where Dzamba had moved to pursue a PhD in architecture, that Dzamba says he was approached by the student team aiming to win this year's Hult Prize. "They asked if I could help them win the semi-final round of the Hult Prize," he recounted. "I started working with them. They seemed to really like the stuff I had. At first it was only an exchange of ideas. Then they liked everything I had so much they basically said if I help them win the semi-finals, they'll find a way to include me on the team -- either add me as a teammate or ... find a way to make me a partner in any company they found." Not long after that, Dzamba got a decidedly different message. His peers told him the Hult prize wouldn't allow a six-member team -- and they were no longer interested in adding him as a partner. "That was a bit of a tough moment," Dzamba says. For its part, the five-member team that won the prize -- Shobhita Soor, Zev Thompson, Gabriel Mott, Mohammed Ashour and Jesse Pearlstein -- told the Huffington Post they worked well within competition rules. "We did not invent the concept of farming insects, for food or otherwise, nor did Jakub Dzamba," Jesse Pearlstein countered. "Further, the idea was not unique at all. This year, there were three teams who entered the Hult Prize with insects as a proposed solution. What made us distinct was our business model, which has nothing to do with Jakub." But the war of the crickets had already begun. After his rejection from the team last March, Dzamba tried negotiating to no avail. Then he tried talking to the business faculty as a third party. No luck. Finally, he got the ear of administration. Four associate deans and a commercialization officer (the patent guy), convened to weigh the case. They came up with a two-part remedy. Firstly, McGill would file a pending patent for the cricket farms Dzamba designed in his name alone. And secondly, the team would pay him $5,300 for the work he had already done. Dzamba says he would have been content to sign off on that offer. But he claims the Hult team added one very difficult condition. "I had to sign a release order and a suppression of discussion," he said. Essentially, it was a gag order. "That statement was so broad and so aggressively written if I had signed it, I would not even be able to speak to my own professor about my invention. "It would have kind of defeated the purpose of the PhD." Dzamba declined, adding the very next day the team sent an email heavy on the legal menace. "That's where things are at the moment," he said. "I haven't heard from them." So that leaves him with crickets. But for Jakub Dzamba that may not be a bad thing at all. "I have my own plans. I'm developing my own cricket farming units in my apartment," adding that he's getting "quite a bit of interest" from abroad. "They're more modest plans than starting off with a million bucks. But I still have plans to bring these to market."